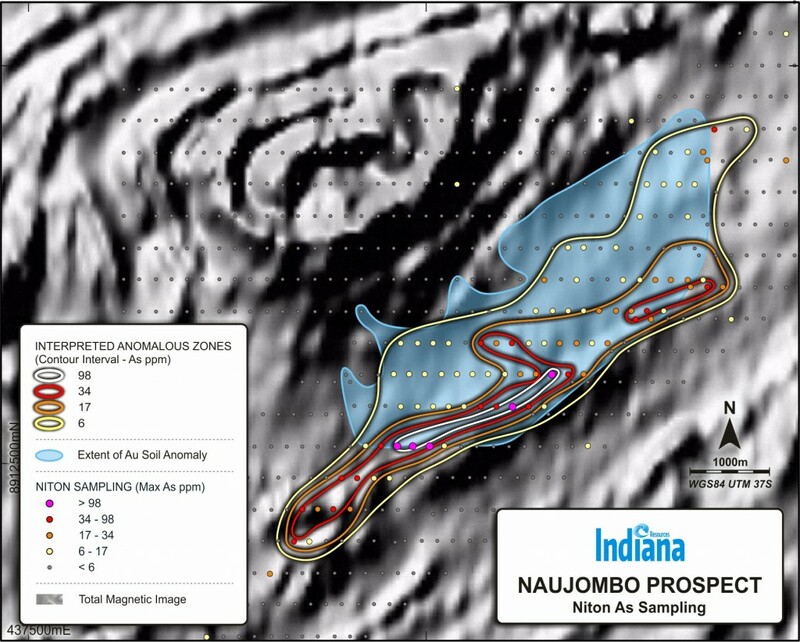 Soil sampling conducted during the December Quarter 2014 delineated an extensive gold-in-soils anomaly located approximately 35km north-east of the Kishugu Gold Target. 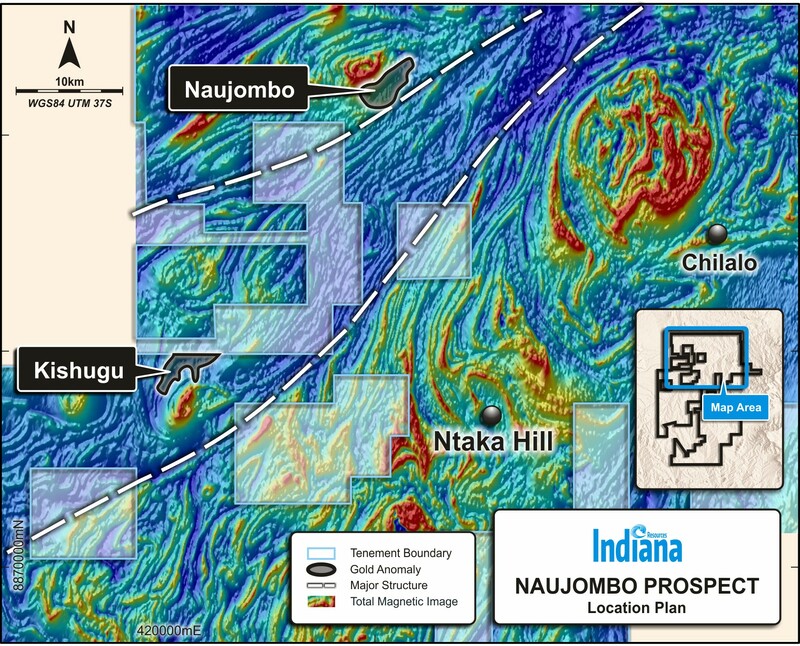 It is in a similar geological setting to Kishugu, being located near a major first order splay fault off the same regional structure that transverses the Kishugu anomaly. Both anomalies are associated with very similar folded geological features. 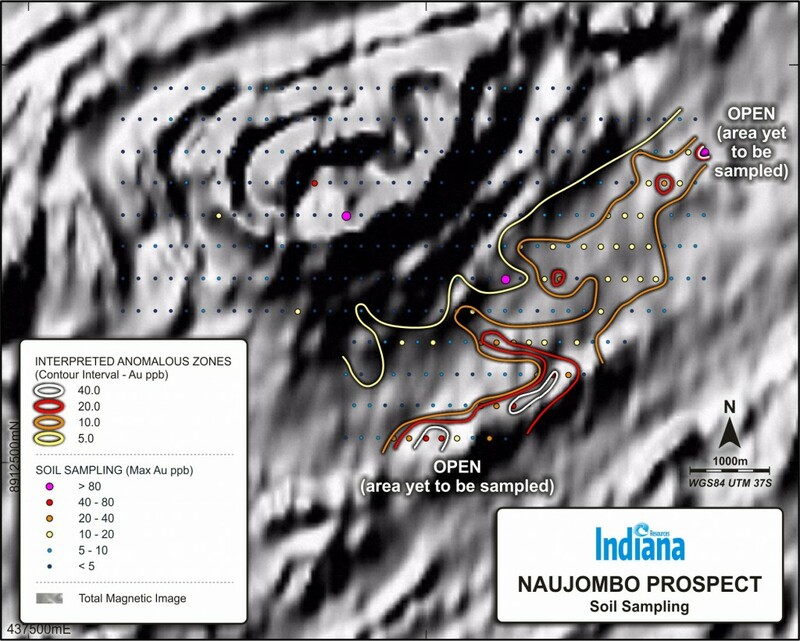 Initial soil sampling was conducted on a 400m x 200m grid with maximum values of up to 131ppb Au in the main anomaly. The anomaly measures approximately 5km in length by 1km wide at greater than 20ppb Au and remains open in three directions. Naujombo also exhibits multi-element anomalism including arsenic, bismuth and silver, which are typical pathfinder elements for gold deposits and similar to the geochemical signature of Kishugu. Initial soil sampling left the anomaly open to the north-east and south-west. Soil sampling carried out in the second half of 2015 to close off the Naujombo anomaly was analysed by a Niton X-Ray Fluorescence analyser (‘Niton’). The Company uses the Niton on all soil samples collected on the Nachingwea property as a low-cost pre-screening tool before submitting samples for the more expensive laboratory analysis. Although the detection limits on the Niton are too high to detect gold directly, there are other proxy elements which can infer anomalism associated with gold. The Naujombo arsenic levels most closely correlate to existing laboratory analysed gold data and the Niton results have extended the anomaly further to the south-east for more than 1km, to over 6km.